Over the past year, as the "Islamic State" ("Islamic State of Iraq and the Levant," ISIL, ISIS or IS in English, Daesh or DAISH in Arab) has ceded its positions in Syria and Iraq, the architects of the world caliphate are said to be stepping up their activity in Afghanistan. In summer, the U.S. military reported it had liquidated three ISIL field commands in that country, and later the Russian Foreign Ministry announced that somebody had been transferring Islamic militants to Afghanistan using light helicopters without identification marks. At the same time, the decreasing defensive capability of the neighbouring Turkmenistan, which began, according to various sources, in the first half of 2010 could lead to the gradual penetration of the terrorist organisation into the territory of this post-Soviet republic. And Ashgabat's close and friendly relations with Afghan authorities could only simplify and speed up this process. Turkmenistan is a closed country, and there is no reliable information about the current state of its armed forces. The authorities of the republic openly published data on military expenditures for several years after gaining independence, but in 1999 they ceased to do so. According to the CIA World Factbook, in 2016, Turkmenistan's gross domestic product (GDP) amounted to US$95.5 billion. At the same time, according to the Nation Master portal, Turkmenistan's military expenditures were pegged at 1.6 per cent of the GDP in 2011. Assuming that this indicator has not decreased since then, the country spent about $1.5 billion to develop its armed forces last year. In fact, the development of the country's economy since 2014, when prices for hydrocarbons—the main article of Turkmen exports fell—is constantly slowing down, the revenues of the state budget are declining, which affects, among other things, the armed forces. Today, in Turkmenistan, men aged between 18 and 27 are called up for service, and with a written request, can be enlisted in the army from the age of 17. You can enter military training in Turkmenistan from the age of 15. According to various estimates in this country, an average of 53,000 people reach military age annually. At the same time, there are strong clan contradictions in the republic, because of which the draftees in an overwhelming majority of cases are sent to serve not in the areas to which they were called initially. It is believed that this phenomenon reduces the number of cases of desertion. The armed forces of Turkmenistan include three types of troops: the Ground Forces, the Air Force and the Navy, the total strength of which does not exceed 40,000. In 2016, the country's authorities adopted the latest military doctrine confirming the status of Turkmenistan as a neutral state (approved by the United Nations in 1995), which reserves the right to use armed forces only to prevent internal conflicts, suppress separatist movements and extremism, fight countries spreading weapons of mass destruction and their means of delivery, which may pose a threat to Turkmen national security. According to various sources, Turkmenistan has 10 T-90S and 670 T-72 tanks, 170 combat reconnaissance and diversion vehicles BRDM-1 and BRDM-2, 930 BMP-1 and BMP-2 infantry fighting vehicles, 829 armoured personnel carriers BTR-60, BTR-70 and BTR-80. Moreover, 40 self-propelled artillery systems 2S1 “Carnation,” 16 2S3 “Akatsia,” 17 2S9 NONA-S, 180 D-30 howitzers, 17 D-1 howitzers, 72 D-20 howitzers are in service with the ground forces, along with about 70 PM-38 mortars and 31 2B9 "Vasilek." There are military and 128 multiple-launch “Grad,” “Uragan,” and “Smerch” rocket systems. The air force park of the Turkmen Air Force is relatively small. It consists of only about 20 Mig-29/UB fighters, three Su-7B fighter-bombers, 65 Su-17 fighter-bombers, 43 Su-25MK attack aircraft (some of them were upgraded in Georgia in the second half of 2000) one AN-26 transport vehicle, two L-39 training aircraft, 10 Mi-24 transport and combat helicopters and eight multipurpose Mi-8s. The air defence systems of Turkmenistan are represented by 50 of the S-75 “Dvina” (NATO reporting name SA-2 Guideline), S-125 “Pechora” (NATO reporting name SA-3 Goa), and S-200 “Angara” (NATO reporting name SA-5 Gammon) anti-aircraft missile systems. The naval forces of Turkmenistan are represented by the Caspian fleet operating as part of the joint Russian-Kazakh-Turkmen fleet under the formal Russian administration (in the event of a local conflict, the parties may withdraw from the subordination of the Russian command), and a small river fleet on the Amudarya River. The Turkmen Navy has five “Grif-T” patrol vessels, two Project 12418 “Molniya,” and one Point Jacksonpatrol vessel. In fact, the Turkmen fleet is the weakest in comparison with the fleets of other countries operating in the Caspian Sea. Most of the weapons and military equipment of Turkmenistan was produced in the Soviet Union and since then has undergone only scheduled repairs. 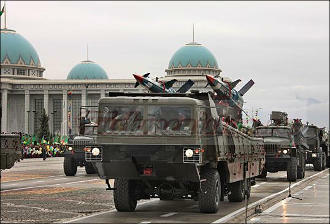 Nothing is known about the current state of the country's military equipment. Presumably, in the beginning of 2010, a crisis began to develop in the armed forces of Turkmenistan. First of all, this was due to the increased requirements for draftees. In particular, only men from families that had served for the last three generations could be given criminal responsibility, and could be called to the Presidential Security Service, the State Migration Service and the Ministry of National Security. In those years, several military registration and enlistment offices in Turkmenistan complained that due to the demand there was a shortage in these formations. In 2013, the first reports began to appear that soldiers had stopped receiving regular monetary allowance in the armed forces of Turkmenistan, which at the time was said to be about $14. A year later, the Chronicle of Turkmenistan published an interview with one of the retired soldiers of the Turkmen army, in which he claimed that the army had stopped giving allowances to its employees. At the same time, the soldiers had to sign on the statements of the receipts. All of this led to worsening of morale among the troops: harassment and extortion by officers had intensified. As a result, the draftees began to actively seek ways to get a postponement from military service, or even avoid getting called altogether. Cases of paying bribes to the staff of military registration and enlistment offices became more frequent. According to various sources, in order to avoid military service, it is necessary to pay between $300 and $500, depending on the district of conscription. If you turn to the central military registration and an enlistment office for help, you can buy a military certificate for $1,600 to $1,700, with all the grades related to the passage of service. At the same time, the flight of young people from the country has intensified—people are trying to leave to study abroad and do not return until they reach the age of 27. In 2013, about 12,000 Turkmen studied abroad. By comparison, in 2009 there were only about 2,500. Today, according to various estimates, more than 20,000 Turkmen study abroad. In the autumn of 2013, a new presidential decree on education came into effect in Turkmenistan, which increased the schooling period from nine to 12 years. As a result, students have already reached the age of conscription at the school, but they cannot be summoned because they have not yet received the graduation certificate. Indirectly, a significant increase in the length of service is indicative of a substantial shortfall in conscription. According to the law on armed forces, the term of service in the Turkmen army is 24 months, but quite often the draftees have to stay in the troops for a longer period. Turkmenistan partially inherited this form of national service from the Soviet Union. In particular, dismissal from the service occurs after the signing and publication of the presidential order. However, as early as 2015, it was reported that in some districts of Turkmenistan, conscripts continued to serve six to seven months after the publication of the order to transfer them to the reserve. Against this background, the underfunding of the armed forces continues to increase. In particular, in the fall of this year, rations began to be cut among military units. As the Chronicle of Turkmenistan wrote, the military units in the Mary velayat (region) were allotted a reduced ration, as there weren’t enough funds to buy food. In order to somehow solve the problem of food for draftees, one of the units was allowed to open a private dining room, where soldiers could buy their own food. In this case, instead of a monetary allowance, the draftees usually received a subscription to the “Esger” (“Warrior”) or “Goshun” (“Army”) newspapers. The deterioration in the finances of the armed forces of Turkmenistan is only one of several evidences that reflect a general economic deterioration in the country and a decrease in the revenues of the state budget. In June 2017, President Gurbanguly Berdymukhamedov, said the system of social benefits had become completely ineffective and ordered them to be annulled. Benefits, quotas for free electricity, gas, and water, along with previously cancelled free gasoline, was introduced under the late president Saparmurat Niyazov. Announcing their cancellation, Berdymukhamedov said there is no need for them, allegedly due to the improvement in the economic situation and growth in the population's incomes. Nevertheless, it seems that due to the closed economy, a rigid vertical of power and deliberate distancing of the country's authorities from world’s political and economic processes, Turkmenistan cannot realise this potential by raising budget revenues. In 2015, the construction of the TAPI gas pipeline (Turkmenistan-Afghanistan-Pakistan-India) began. It was assumed that the joint pipeline, with a design capacity of 33 billion cubic metres of gas per year would increase Turkmenistan's revenues from the sale of natural resources. Initially, the gas pipeline was planned to be launched in 2017, but the deadline was postponed to 2018, and then to 2019. At the same time, there is no certainty about the last date either. There are two serious reasons for postponing the deadlines: lack of funding and aggravation of the internal Afghan conflict in the background of the penetration of the militants of the "Islamic State" into the country. A weak economy cannot be a guarantee for strong military forces. 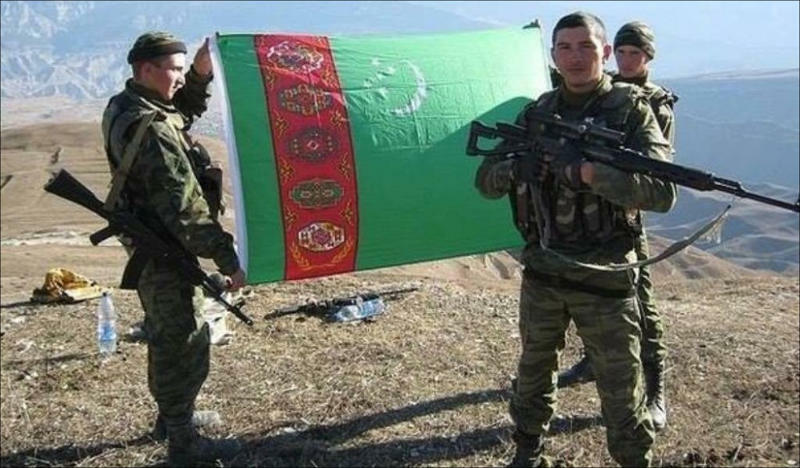 A few years ago, the Turkmen army’s fighting capacity was ranked at the middle position in the region, surpassing the armed forces of Kyrgyzstan and Tajikistan, but yielding to the armies of Uzbekistan and Kazakhstan. Today, the fighting capacity of the Turkmen army is being questioned due to increased external threats and a crisis in the economy. Most likely, the republic can still resist the attempts of small combat groups of militants to penetrate its territory, but in a hypothetical local conflict with any of its neighbours, Turkmenistan will not stand without external help. Moreover, it will not cope with the full-scale invasion of extremists from Afghanistan, separated from the republic by a 300 kilometre-long border. Today, Turkmenistan and Afghanistan maintain friendly relations. In addition to the participation of these countries in the TAPI gas pipeline project, these states jointly rebuilt a cross-border road in the region of the Turkmen Serhetabat in 2007. In 2016, the first stage of the Asian Railway between the Turkmen Atamyrat and Imamnazar and the Afghan Akina was opened. Earlier, Turkmen President Berdymukhamedov promised that Ashgabat would render assistance to Afghanistan in the post-war recovery of the economy. Meanwhile, during the last couple of years, armed clashes have been constantly taking place on the Afghan-Turkmen border. During the middle of last year, several dozen Turkmen servicemen were killed, according to unofficial data. An increase in the number of such incidents can be attributed to the arrival of the Taliban in the border provinces of Afghanistan, who are gradually being ousted from the interior of the country by Afghan and U.S. military. At the same time, the focus of ISIL activity on Afghanistan is still concentrated in the east of the country, near the border with Pakistan, and there is no immediate threat for Turkmenistan. The CIS Today website, referred to Durdy Charyev, a veteran of the border troops of Turkmenistan, who wrote that the armaments and equipment on the border have been modernised and new separation facilities and barracks were built a few months ago. The veteran spoke about more serious training for servicemen. There is no reliable information on the composition and armament of the country's border service. In 2010, it was reported that there are three border detachments in its composition, two of which are located on the border with Afghanistan. Until 1999, an agreement was in place to jointly protect the Turkmen border, in which border security was provided not only by the Turkmen troops, but also by the Russian military. In 1999, Russian border guards left Turkmenistan at the request of the government of that country. Experts suggested this was done so that Turkmenistan could fully control the drug traffic from Afghanistan. During the entire period of independence, Turkmenistan has maintained neutrality, but it is unknown how much this policy will be relevant in the coming years. It was recently reported that President Berdymukhamedov is meeting with his Russian counterpart, Vladimir Putin, quite often. In early October, the two signed an agreement on strategic cooperation, implying, among other things, increasing trade between the two countries. It is possible that in the end, a fundamentally new agreement will be reached on military cooperation that will call the non-aligned status of the republic into question and force it to reconsider its views on neutrality.